ADULT: Wingspan - 40 - 52mm. The males forewings white upper surface and extensive orange tips are immediately diagnostic. The tip to the forewing is darker and a small dark mark is found just inside the orange patch. The females have no orange area with a black patch at the apex and a more rounded edge to the wings apex. 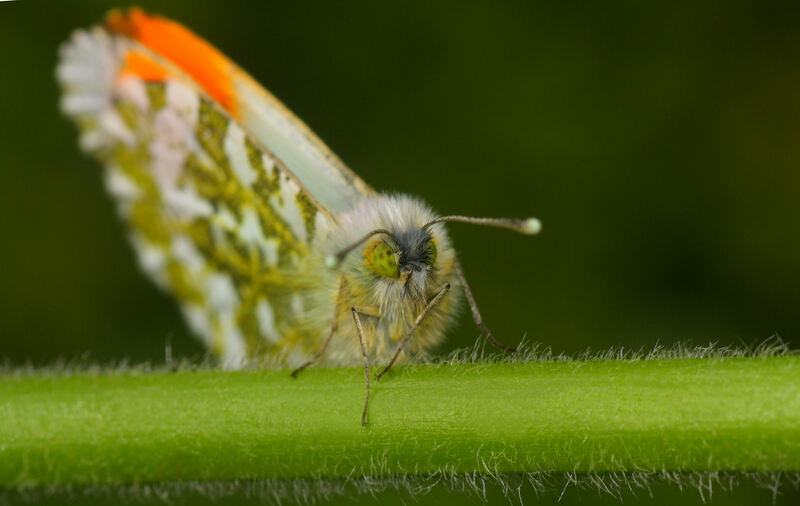 The undersides of the hindwings of both sexes are a mottled green and white with the forewings undersides as above but pale greenish grey towards the tip. CHRYSALIS: 23mm. Can be either brown or green and located in dense undergrowth. LARVA: 31mm. Greyish green to frosted white, darker green below. Located on a variety of crucifers preferably cuckooflower and garlic mustard. EGG: Orange, bottle-shaped located on crucifers such as cuckooflower, garlic mustard and charlock. Hatching time within 7 days. BEHAVIOUR: A busy little character that is always on the go sometimes just back and forth over the same area. Fortunately they are only active when the sun shines so with a little luck specimens can be located and observed more closely. HABITAT: Damp meadows, woodland edges, hedgerows, grassy verges. FLIGHT PERIOD: May - June.